Welcome back to Longbox Junk's Halloween Party! Just remember. . .Human Resources is still coming in on Monday, and they don't base decisions on how much you had to drink. Got it? Let's do this! Previously, I reviewed a handful of DC's annual Halloween Specials and was pretty disappointed. For the price they were charging, there were very few good stories. The running theme seemed to be 2 good, 2 bad, and the rest filler in all three issues I took a look at. Worse. . .for comics with taglines like "Embrace the Terror! ", there wasn't a single story that really could be called a horror story. They were mostly just DC Superheroes in sorta spooky situations or having Halloween fun. If I'm paying a solid 6 bucks on a comic shouting "13 TALES OF TERROR!" on the cover, is it unfair to expect possibly getting some horror stories? Look. . .I get it. DC was trying to focus a bit more on the fun side of Halloween than on terror. There's nothing wrong with that. They weren't all bad, but I was disappointed that what they were selling and what I got were two different things. So why am I going on about three comics I've already reviewed instead of getting to the comic at hand? 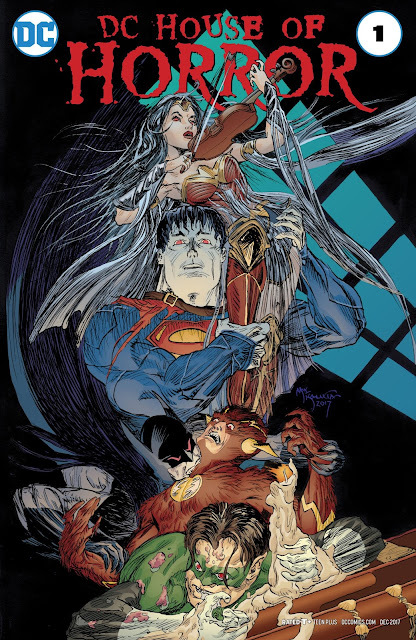 Because the comic at hand today is DC's 2017 Halloween Special. . .titled DC House of Horror. Will THIS Halloween Special actually live up to its name, or will I once again feel the bitter sting of an EIGHT DOLLAR comic book delivering two bucks worth of quality? Let's find out! Martha Kent is relentlessly pursued by a malevolent creature from another world that crash-lands on her Kansas farm. This is a great opener for this issue! 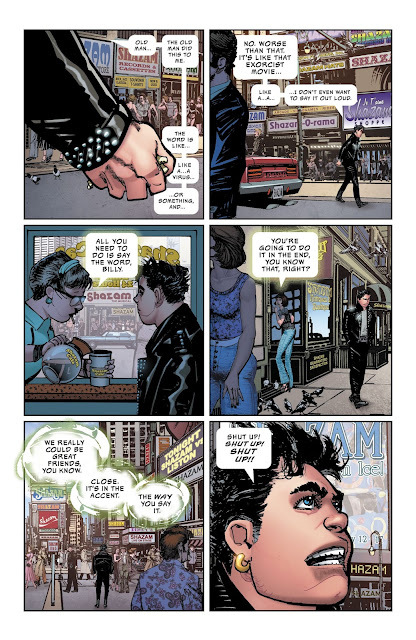 The story is told in an extremely cinematic style in both writing and art for an Elseworlds-style retelling of baby Superman's arrival on Earth. It's a pretty brutal little story that's basically a "monster chase" but I'm happy to finally see some actual horror in one of DC's horror anthologies. A solid 5 out of 5! During a Ouija board party, a young woman becomes possessed by the spirit of an ancient Amazon warrior and goes on a bloody killing spree. Not bad. Not quite as good as the opening story, but as far as these anthologies go, 2 for 2 good stories is a solid start. I liked the idea of Diana being an ancient spirit, and how a lot of this story is left up to the reader to figure out what is happening (Diana speaks in a foreign language. Greek, maybe?) 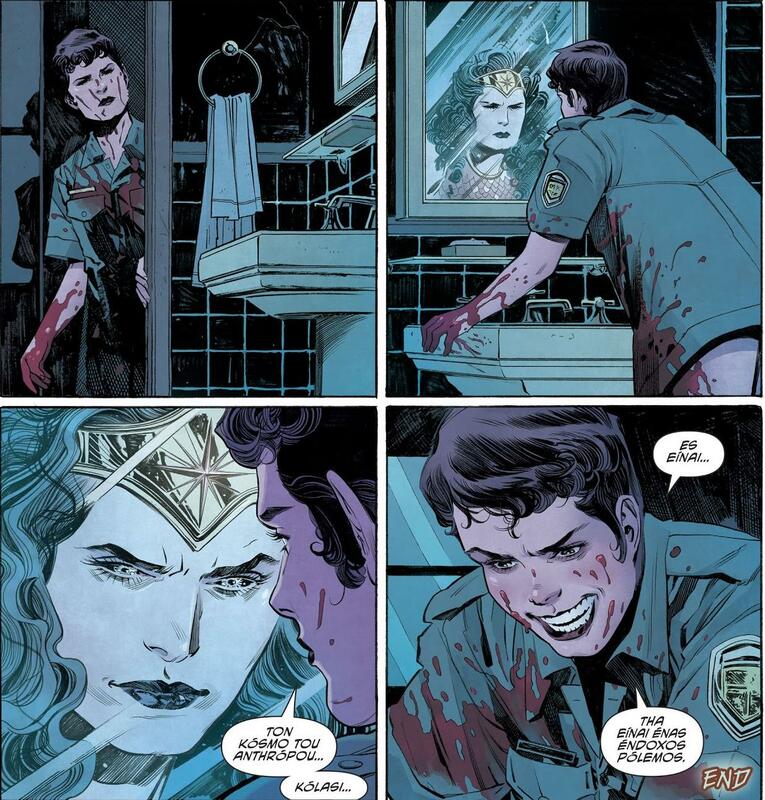 Diana's brutal joy in slaughtering men is pretty terrifying, just check out that insane grin below! This one gets a 4 out of 5. 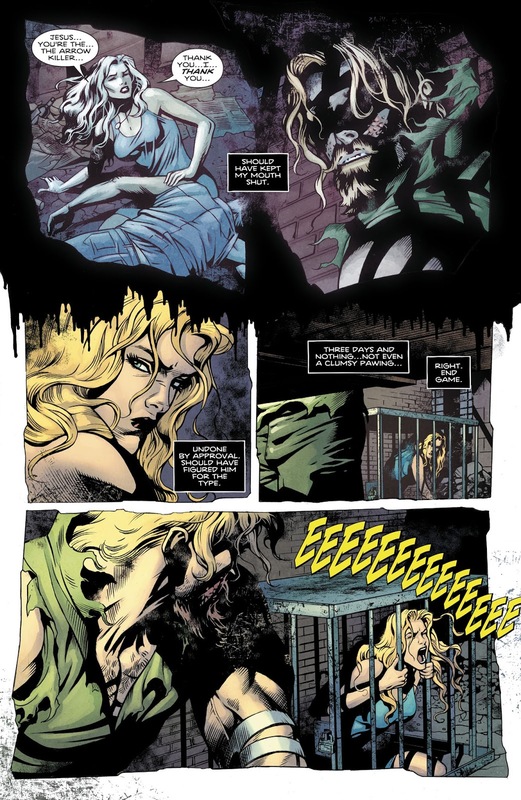 The spirit of Harley Quinn torments a construction worker after encountering her during the demolition of Arkham Asylum, turning him into a killer. And now we come to the first "okay" filler story. 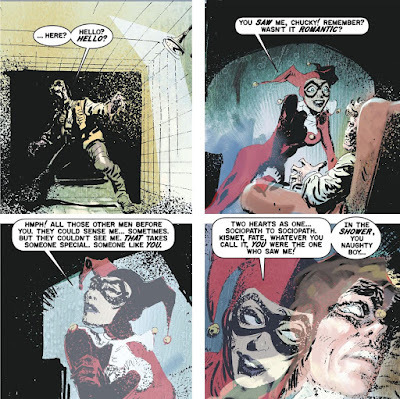 The idea of Harley Quinn as a malevolent ghost torturing an innocent man into becoming a killer is pretty interesting, but the execution falls a bit flat. The art is a bit disappointing here as well. Normally, I like Kyle Baker's art, but here it just seems really sketchy and rough. This one barely gets a 3 out of 5. Bruce Wayne is forced to confront the truth of why he can never defeat The Joker. . .because he IS the Joker. This story is probably my favorite in this issue. It's a VERY dark psychological journey into a different version of Bruce Wayne than we're used to. . .one that killed his abusive parents and was sent to an insane asylum as a child. This version of Batman is brutal and deranged, but still convinced he's a hero. His finally realizing that he is is own worst enemy drives him over the edge to suicide. I really like the mental struggle as Bruce tries to reconcile what he believes and what the truth is about his crusade against crime. A nice little Elseworlds story and a definite 5 out of 5. 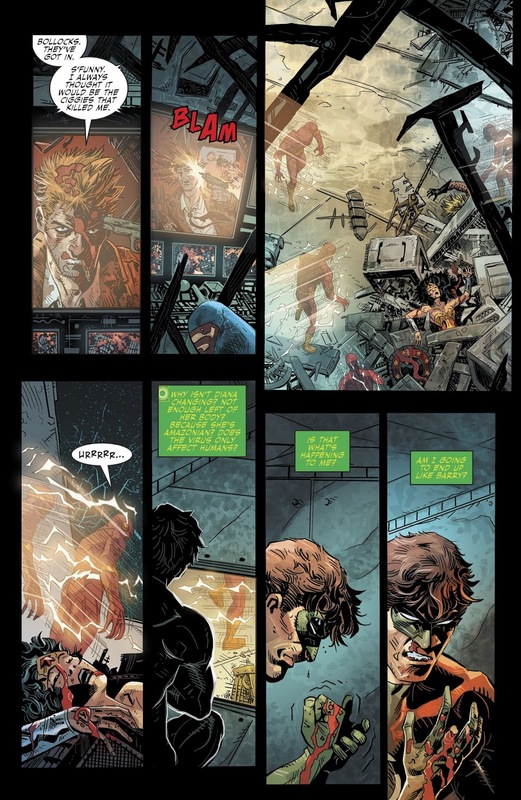 At the Justice League's Moon Base, Hal Jordan is the last survivor of a virus that has swept over Earth, turning humans into the living dead. . . 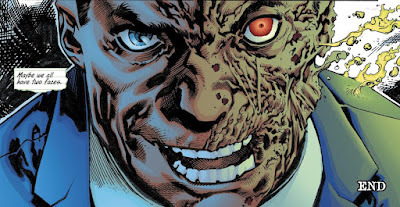 I'm not very familiar with Marvel Zombies, but superhero zombies seem to have been pretty well done already. That said, this is a pretty good story. Jordan trying to survive against the likes of The Flash and Batman without his power ring makes for a pretty desperate narrative. I didn't really like the way that Zombie Batman was drawn, though. The rest of the art was fine. . .especially the final panel of Jordan blowing up the tower (and himself) to stop the infection from spreading via the League teleporter to other planets. I give this one a 3 out of 5. When the "Arrow Killer", a brutal vigilante, takes a beautiful woman prisoner, he discovers that sometimes the predator is the prey. . . I really liked this story's take on Green Arrow as a grungy, deranged serial killer convinced he's a hero. . .but the twist of his prisoner (Black Canary) ALSO being a serial killer and taking him down was a surprise. The dark, twisted artwork perfectly compliments the dark and twisted story. I give this one a 4 out of 5. District Attorney Harvey Dent discovers that the serial killer he has been pursuing is actually himself. And here we are at the first bad story in this collection. It's toward the end, so at least there's that. 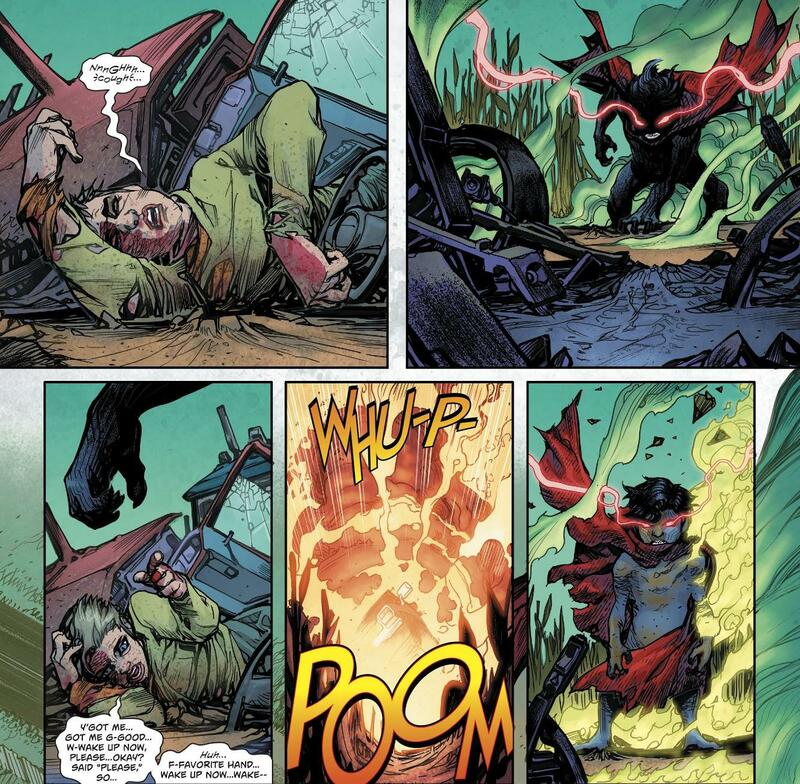 The angle of Dent being the killer is okay, but it's set against a ridiculous giant monster invasion that really makes this story as schizophrenic as Harvey. Is it a sorta-noire detective story with a horror twist. . .or is it a Giant Monster B Movie without a hero? The art is good. The story is bad. A disappointing 2 out of 5. Voices and visions relentlessly provoke a young man to say a single word. And we finish this thing off with another bad story. A damn shame, considering the strong start. This story isn't quite as bad as the Two-Face entry. It's actually an interesting idea. . .Billy Batson slowly becoming obsessed with the word "Shazam", seeing and hearing it everywhere, but fearing what will happen when he says it. Unfortunately, the execution isn't great and the ending when he finally says the word just sort of leaves the reader hanging. It's supposed to be thought-provoking, but it's just kind of annoying. A weak 2 out of 5. Overall, I have to say that I liked this DC Horror Anthology quite a bit more than the other three I reviewed earlier this month. With 4 stories out of 8 being good, 2 being pretty good, and 2 bad ones, the ratio of good to bad is a lot more what I'd expect out of a comic that DC had the guts to ask EIGHT DOLLARS for. Value for cost aside, what I really liked about this issue was that there's actual HORROR in it. By taking this issue in an Elseworlds direction, the writers were free to run with some pretty brutal and dark stories. This comic is NOT for kids. There's some pretty twisted stuff in here. 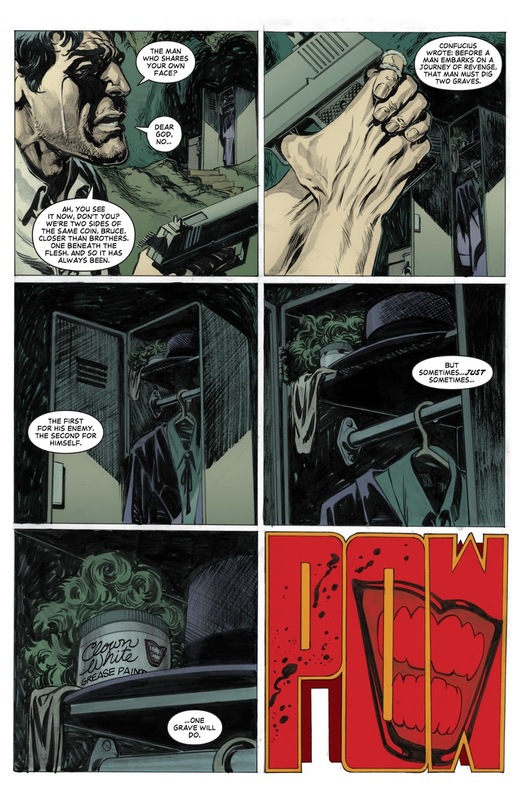 But if you're looking for some actual horror in a horror comic, this is a decent way to go. It's not worth eight bucks, but it's worth a read if you can find it cheap. This Halloween Party ain't over yet! I also got this one last year, but didn't buy any of these expensive ones this Halloween season. The cover prices are just too much, anymore. Thanks for your reviews of each story! This year's Halloween Special was TEN BUCKS! They don't even throw on a stiff cover and squarebound back to help ease the sting any more. I didn't mind shelling out a few extra bucks for the old "Prestige Format" books they used to do, but this is getting ridiculous. Thanks for reading! I saw that $10 hallowen special. I ended up putting it back. It looks great, but man...ten bucks!